This article is about the set that contains a R2-D2 figure. For the set that contains a C-3PO minifigure, see Tatooine Mini-build (Celebration Anaheim). The Tatooine Mini-build is a Star Wars: Episode IV A New Hope set sold during Fan Expo Canada. The set contains R2-D2. 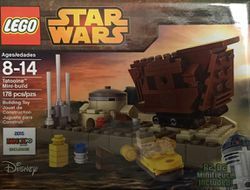 It contains mini brick-built figures (C-3PO, R2-D2, and two Jawas), a mini landspeeder, mini sandcrawler and a mini model of the Lars homestead. Facts about "Tatooine Mini-build (Fan Expo Canada)"
This page was last edited on 18 August 2017, at 01:11.